The AVS Pacific Rim Symposium on Surfaces, Coatings and Interfaces (PacSurf 2018) will be held on the Big Island of Hawaii from December 2 – 6, 2018. 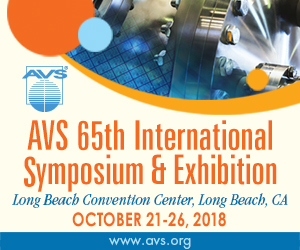 This conference is being organized by AVS (United States) with a Steering Committee composed of representatives from Australia, Canada, China, Japan, Korea, Mexico, New Zealand, Philippines, Singapore, Taiwan, and the United States. Symposium attendees will interact during morning and evening sessions that will include plenary, invited, and contributed presentations.The main topics for PacSurf 2018 will be focused on the latest advances in Biomaterial Surfaces & Interfaces, Energy Harvesting & Storage, Nanomaterials, Plasma Processing, and Thin Films. We will have morning and evening technical sessions with the afternoons free for other activities and discussions. The conference will be held in the Waikoloa Beach Marriott Resort and Spa on the Big Island of Hawaii. We are confident you will benefit by attending PacSurf 2018 and networking with the other attendees. Mauricio Terrones, obtained his B.Sc. degree in Engineering Physics with first class honors at Universidad Iberoamericana, and was distinguished as the Best Student of Mexico in Engineering Physics in 1992. In 1994 he started his doctorate degree with Sir Prof. Harold W. Kroto (Nobel Laureate, FRS), and received his D.Phil. degree from University of Sussex in 1998. He has co-authored more than 400 publications in international journals, and counts with more than 45,000 citations to his work (His H index is 97; Google Scholar H=109). He has published in Nature, Science, Phys. Rev. Lett., Nano Lett., Nature Nanotechnology, Nature Materials, Nature Communications, Nature Chemistry, ACS Nano, PNAS, etc. In 1999, he was awarded the Alexander von Humboldt Fellowship, and carried out research at the Max-Planck Institut für Metallforschung (Stuttgart, Germany). In 2000, he was recipient of the Mexican National Prize for Chemistry. He also received the Javed Husain Prize and the Albert Einstein medal from UNESCO in 2001. In 2005, he received the TWAS Prize in Engineering Physics for his contributions in the field of carbon-based nanomaterials. This prize is given by the Academy of Sciences of the Developing world, and Mauricio is the youngest scientist ever to receive any TWAS award. In 2005, Terrones also received the “José Antonio Villaseñor y Sánchez” Prize, awarded by the governor of the state of San Luis Potosí, for his contributions to Nanoscience. He is member of the Mexican Academy of Sciences since 2002. In 2007, Terrones was elected the National Contact Point in Nanotechnology with the European Union. In 2012 was elected fellow of the American Association for the Advancement of Science (AAAS). In 2015, he was elected fellow of the Royal Society of Chemistry (UK) and was awarded the Jubilee Professorship from Chalmers University of Technology (Sweden). In 2016, Mauricio was awarded the Faculty Scholar Medal in Physical Sciences (Penn State). In 2017, Terrones was also elected fellow of the American Physical Society (APS). 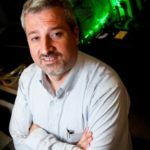 Mauricio is the Editor in Chief of Carbon, and he is currently associate editor of 2D Materials, Journal of Materials Research and Nature Scientific Reports. He is Distinguished Professor of Physics, Chemistry and Materials Science & Engineering with tenure at Penn State University. He is also the Founder Director of the Center for 2-Dimensional and Layered Materials at Penn State, and also the NSF-IUCRC Center for Atomically Thin Multifunctional Coatings (ATOMIC).